A nutritional diet is a key to maintaining wellness and a healthy lifestyle. Everyone has heard of the “freshman 15,” but how can you avoid it as a new or current student? Paired with the tips in this article, our nutritional coordinator, Brittany Parham, can help you discover how to strike a nutritional balance. Brittany works with students to navigate the Dining Commons to teach them to maintain healthy eating habits while dining with us at Georgia Southern. 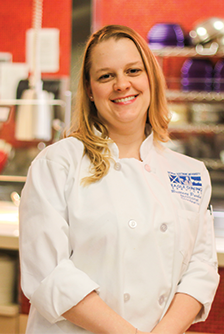 She also assists students with food allergies to ensure they avoid foods containing allergens, providing tours of each food station to students with dietary restrictions and needs. Brittany is also a great resource if you are looking for general information on the Dining menus. To contact Brittany, call 912-478-1208, and follow her on Twitter at @EDSNutritionist. If you have a medically diagnosed condition that would inhibit your dining options and choices, please schedule a meeting with Brittany as soon as possible by calling (912) 478-1208.